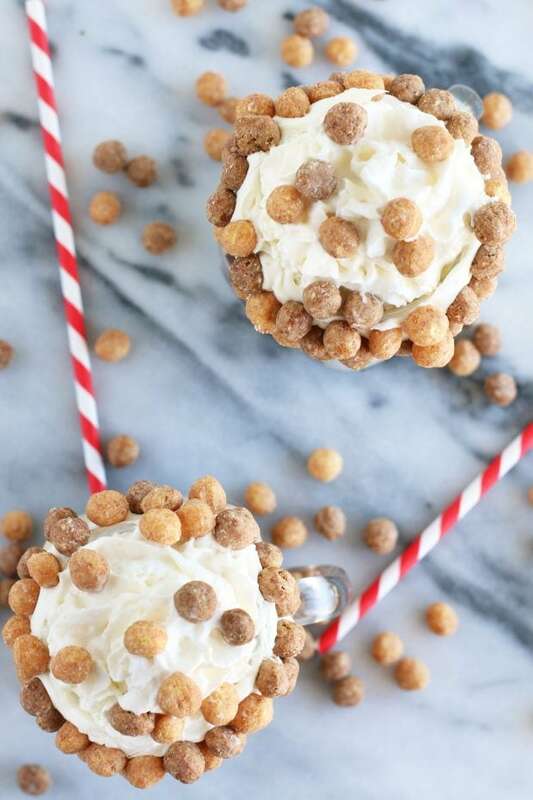 A Boozy Reese’s Puffs Cereal Milkshake will make your childhood cereal wishes come true in an oh-so grown up way! 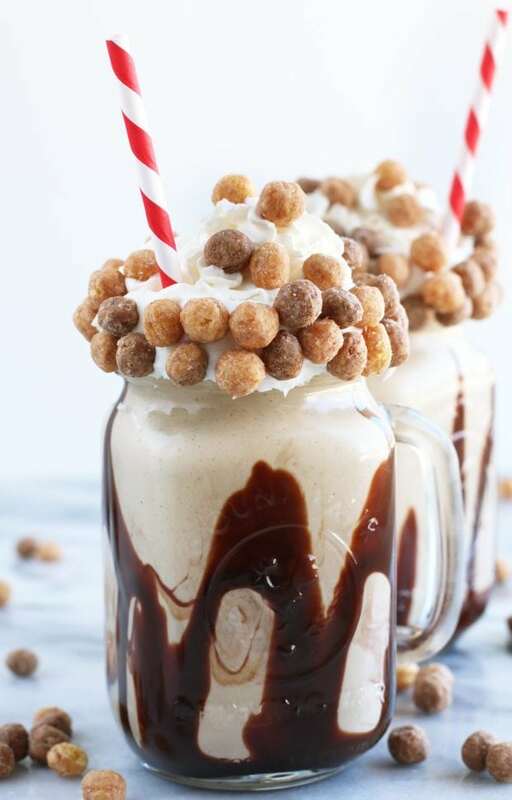 Using homemade Reese’s Puffs cereal milk, extra peanut butter, ice cream and vodka, this boozy milkshake is just the decadent treat to make every Friday night stand out. This happens to be one of those Fridays I am extremely excited for because… I am currently on jury duty. Yes, the first time I get selected for a jury, it’s a 7 DAY trial. SO I have to keep my mouth shut about all the details of the case for 7 DAYS and I am going insane. It’s quite the experience, and that’s all I can say about it. These boozy milkshakes are the most insane, delicious milkshakes EVER. Honestly, the flavor takes me right back to my childhood (well, sans the vodka of course!). Reese’s Puffs was one of my favorite cereals to indulge in. I am totally one of those kids that grew up on cereal. Cinnamon Toast Crunch, Reese’s Puffs, and so many more were the breakfast I came to expect in the morning and quite honestly, as I grew into my college years and beyond, it was hard to part with the habit. Now I that I have an appreciation for eggs benedict, pancakes, waffles and breakfast burritos, cereal has taken a backseat at my breakfast table. So why not bring my favorite cereal to happy hour instead? 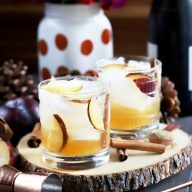 This cocktail is SO easy to make. 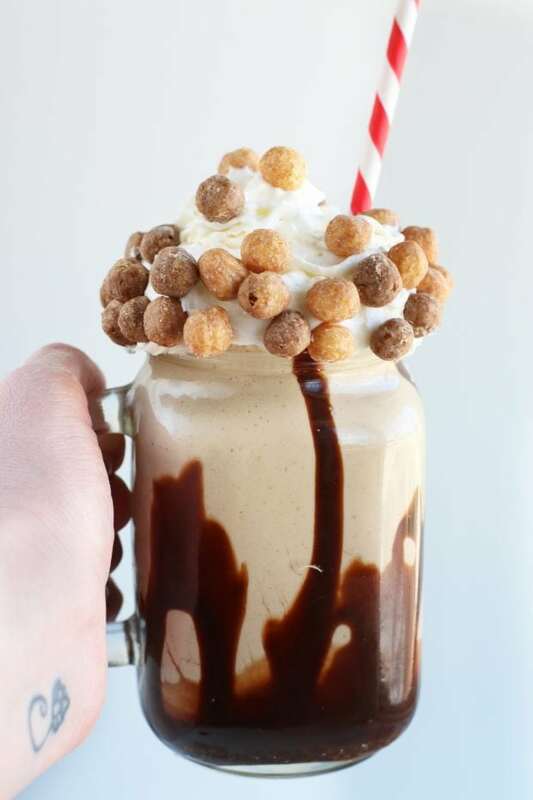 It’s full of that Reese’s Puffs cereal flavor, paired with a little extra peanut butter, creamy vanilla ice cream, chocolate syrup and vodka. It’s extra indulgent, boozy and basically makes me feel like I am floating on cloud nine with every single sip. 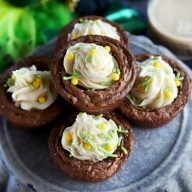 My absolute favorite blender is the ever-so powerful Vitamix A2300 Ascent Series Smart Blender! You will use it for EVERYTHING. KitchenAid 11-Cup Food Processor is one of the most useful appliances in my kitchen. 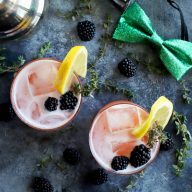 is perfect for serving up this delicious cocktail! 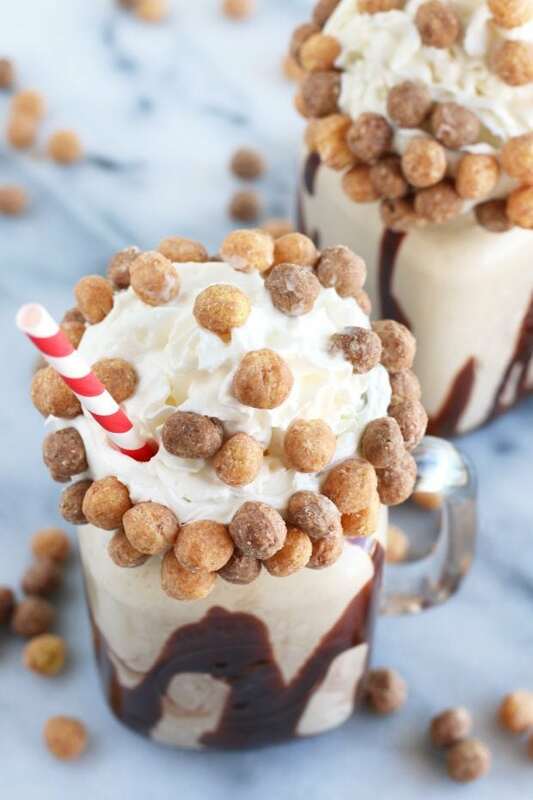 Pin this Boozy Reese’s Puffs Cereal Milkshake recipe for later! 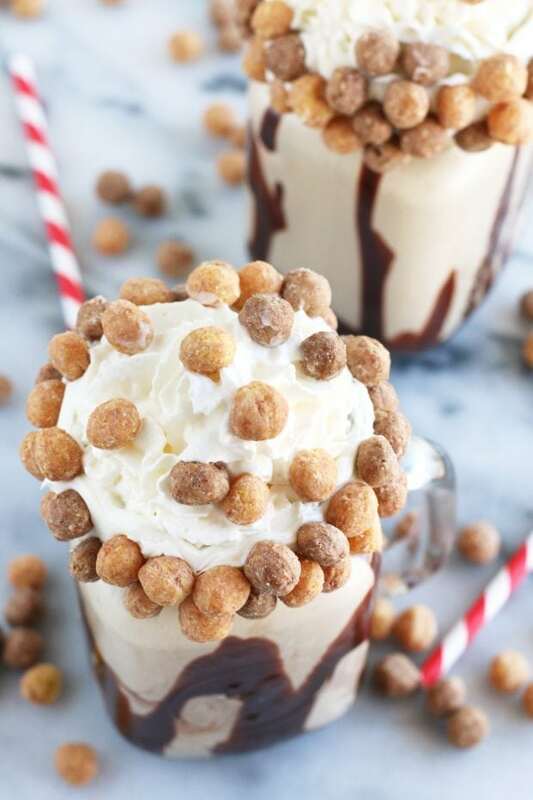 That delicious peanut buttery, Reese's Puffs flavor becomes a smooth and creamy milkshake, with a grown up twist! In the bowl of a food processor, powder the Reese's Puffs cereal. Add the powdered cereal to a bowl. Pour over milk and let sit for 20 minutes. Add the milk cereal mixture to a blender. Add peanut butter, ice cream, and vodka to the blender as well. Blend until thick and creamy. Rim a large glass (I used a mason jar mug) with vanilla frosting. Gently press a handful of Reese's Puffs cereal around the edge. Layer the chocolate syrup around the inside of the glass. Pour in milkshake. 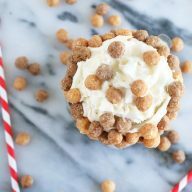 Top with whipped cream and additional Reese's Puffs cereal for garnish. 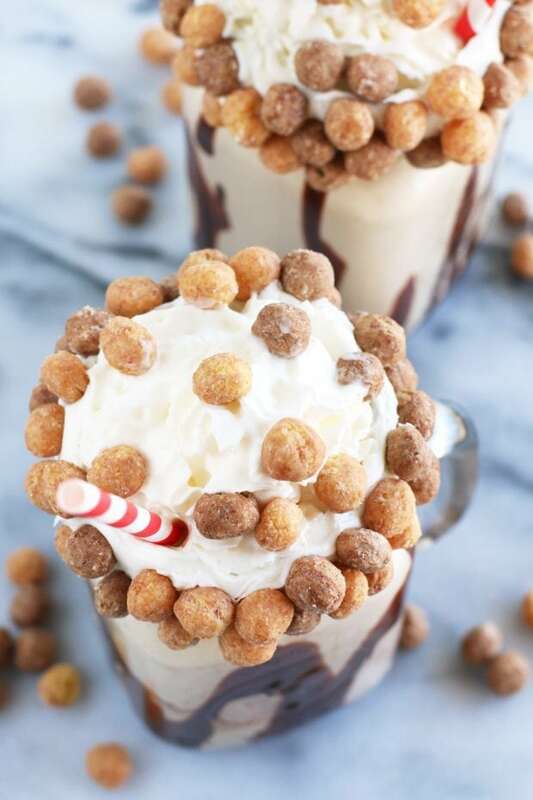 Maybe if you could just figure out how to digitally transport the things you make directly to me, that would be a better use of your time than just making me drool over this milkshake. JKJK. But really, this looks amazing! I loved this cereal as a kid too! Thank you so much!! I wish I could send you one right now!